The Headlands Report: Chow Time! I don't think I've ever before witnessed a bonafide humpback whale stampede. Hell, prior to a few Sundays ago I didn't even know such a thing existed! Sure do now, though. Father's Day 2016 dawned with bright blue skies and nary a puff of wind, the San Francisco Bay a placid, shimmering expanse of gray-green glass in the rising sun. A busy Saturday night at work in the restaurant biz kept me up well past midnight, and it seemed that I had just powered down for some shuteye when the alarm startled me awake at 6:00am. Undeterred and excited (once I remembered why I had set the thing so damned early), I popped outta bed and hopped in the shower, sipped a quick cuppa Peet's Costa Rica and packed up for an 8-hour day on the Mighty Pacific, then walked over to the Marina Safeway for provisions: a coconut-almond Kind Bar (I need more coconut in my life), a hefty, freshly made turkey sando from the deli (delicious), and a bag of dried fruits and nuts (just in case). Out the door and once again toward the bay, at 7:30am sharp I found myself huddled with a group of adventurous, like minded souls by the Saint Francis Yacht Club harbormaster building, listening to our naturalist from Oceanic Society give a detailed introduction on the Gulf of the Farallones National Marine Sanctuary, that incredibly productive and thank goodness protected patch of Pacific Ocean outside the Golden Gate. That wonderful watery world I love so much. 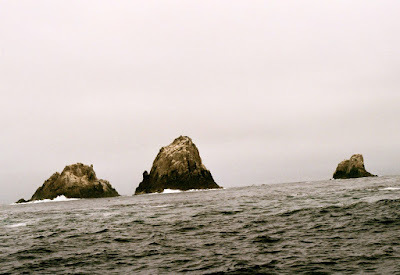 Five hours later we were twenty-seven miles west of the mainland, hunkered down on board the 56' Salty Lady, and had just finished a somewhat leisurely, closeup look at the craggy, desolate Farallon Islands. I write 'somewhat leisurely' because things had changed quite a bit since we cruised under the bridge; the wind was howling in from the northwest, the sea was choppy with whitecaps, the afternoon swell was building - all of it a typical spring and early summer weather pattern in northern California - and our trusty whale watching boat was a rocking! Captain Roger Thomas, a 40+ year veteran of the bay and beyond, kept us in the lee of the islands, however, where the wind and the waves were a little less fierce. Slowly he motored back and forth from Saddleback Islet to Fisherman's Bay and guano-covered Sugarloaf, allowing us a chance to observe the lay of the land, the thousands and thousands of noisy, nesting seabirds - including several colorful tufted puffins, dont'cha know - the local pinniped population of gregarious, acrobatic California sea lions, homely elephant seals and endangered Stellar sea lions, and one juvenile California gray whale that had decided to linger by the Farallones instead of up in Alaska for the summer. By this point in the day we had already seen several humpback whales, and the trip was shaping up to be a very good, if very blustery, adventure. 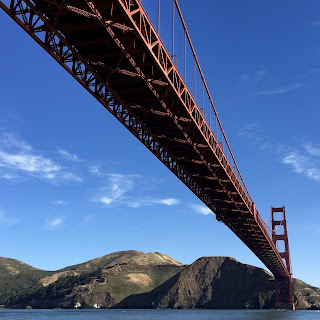 Our first whale sighting was a surprise, lunge-feeding adult about 4 miles west of the Golden Gate; a whale we didn't even know was there, but a whale that was astutely predicted by a 12-year old boy standing at the bow of the boat. 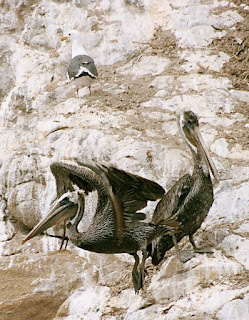 I was up there with him, searching searching searching for a blow, a fin, anything, when he noticed a mad swirl of seabirds diving into the ocean ahead of us. "Look, dad!" he exclaimed, "There's probably a big school of fish right under those birds, right under the surface." I swear not 30 seconds later, right in the midst of all those birds, a gargantuan humpback came charging up from the deep, took an enormous gulp of water and whatever food it was hunting, then settled back into the ocean with a misty blow. I turned to Mikayla, a nice young woman from Dallas who was sitting next to me, and said, "I don't know about you but I'm sticking close by the amateur naturalist over there." Kudos, kid! We were almost to the islands when Salty Lady swung hard starboard and headed south toward another whale watching boat in the distance. Based on the abrupt maneuver I figured our captain had received some good news via radio: good news meaning animals, animals meaning whales, and whales meaning...well, you never know. Ahead we could see spouts - lots of spouts, and one looked so different, so tall and vertical, I immediately thought (hoped)...blue whale? 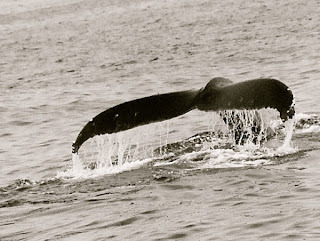 - and were soon treated to our second closeup encounter, a large humpback that sounded in front of us with a beautiful, broad fluke salute high in the air. Like he usually will when a whale dives nearby, Captain Roger slowed the boat, idled the engine, and waited for the whale to surface. We waited, too, but not for long, as smack dab right in front of us, maybe 75 feet from where we stood on deck, rocking back and forth with the motion of the ocean, the whale rocketed from the water in a full on, super spectacular breach! Amazed, shocked, in awe, hooting and hollering our delight, we waited for the humpback to breach again, as they often do, but this time to no avail. Instead, after a few more looks at some other beautiful humpbacks here and there, we turned north again, straight into the howling wind and waves and swell for a Mr. Toad's Wild Ride to the Farallones proper. California and Steller sea lions at the SE Farallones. The Farallon Islands, aka the Devil's Teeth, shrouded in fog. so most trips to the islands visit just the main southeast group. During our close up inspection of the southeast islands, while our naturalist educated us on their history and present day importance, I continued to see blows south of us, back in the area we had already been, but there seemed to be more and more of them with every passing minute. Apparently captain Roger noticed as well, and before long Salty Lady doubled back for a rendezvous. And in this case, by rendezvous I mean whale stampede. 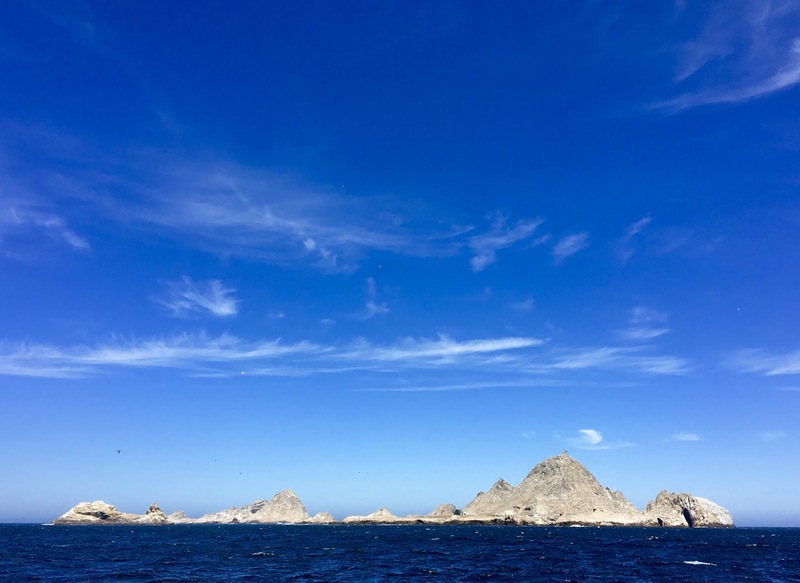 The southeast Farallon Islands on Fathers Day 2016. I swear it was like somewhere way up by the north Farallones someone had clanged a cetacean-sized dinner bell and a slew of hungry hungry humpbacks to our south heard the call. For 20 minutes, maybe more, we bobbed about with the wind and waves, scrambled back and forth across the boat in disbelief, as dozens of humpback whales - two, then three, then two more, then three again, then sometimes five or six together - swam around the boat, right under our boat, at times it seemed directly through the boat...and these whales were bustin' a move! We watched fluke after gorgeous fluke as they sounded one after another, glimpsed the occasional pectoral fin above and below the wind-whipped water, saw their bizarre and bumpy snouts as they hightailed it to who knows where, accompanied by blows and trumpets and quivering blubber and stinky whale breath. It was totally awesome! And each time a group passed there were more spouts to our south, heading directly our way. In my mind I imagined an enormous neon sign suspended in the sky, pointing to the surface of the ocean above the Cordell Banks perhaps. "FREE KRILL! FREE KRILL!" it flashed, as humpback after humpback sped by the Salty Lady in pursuit of food glorious food. 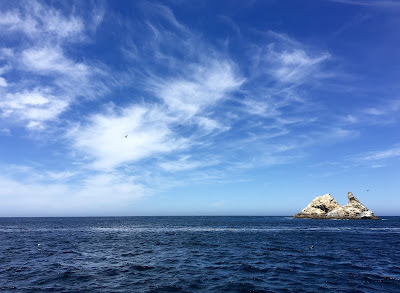 And then, lo and behold, amidst all the fantastic commotion, a call I have not (personally) heard out at the Farallones for several years: "Blue whale!" 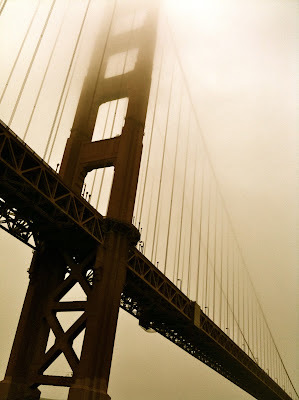 The GGB, seen heading back in from the Farallones. we're gonna pass under that bridge twice." Yup...we were blessed with three different baleen whale species that day - one small gray at the islands, a good look at one gargantuan blue amidst the stampede (possibly two, we couldn't tell for sure), and, oh...I don't know, 50 humpbacks? More? 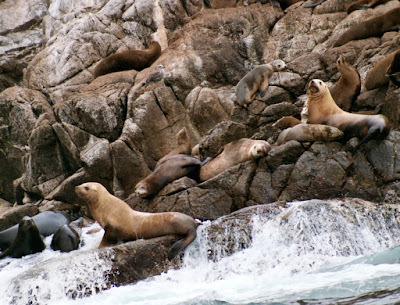 Plus harbor porpoises and harbor seals and sea lions and sea birds by the zillions! It was, in retrospect, a very special day on the Pacific Ocean, in the Gulf of the Farallones National Marine Sanctuary. A windy and wild day for sure - several trips have been cancelled this year due to weather - but a beautiful, glorious and very memorable one to boot. See ya' next time, landlubbers!